High Hopes. 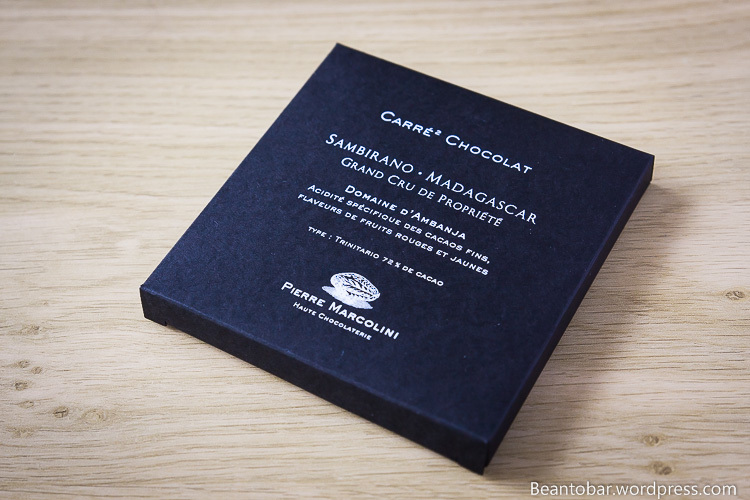 The new single of Bruce Springsteen went through my mind when I finally took this Carré² Chocolat of Pierre Marcolini out of the cupboard for a review. The second bean-to-bar producer in Belgium I found so far. Monsieur Marcolini is a big name in the pralines world in Belgium and his shops are nothing more than luxurious boutiques. Eye candy as far as the eye can see. I visited their stand at the Brussels Salon Du Chocolat a while ago and tasted some freshly roasted cacao beans, full of intense nutty flavors. So obvious I had high hopes for this bar! The package is simply wonderful. Minimalistic, yet luxurious. A black square box with white imprint. Inside, a gorgeous square tablet of chocolate. Once again very minimalistic and quiet recognisable. You can’t miss the Marcolini letters printed over the bar. the pieces are pretty big compared to other manufacturers bars and the thickness is impressive too. Nice. 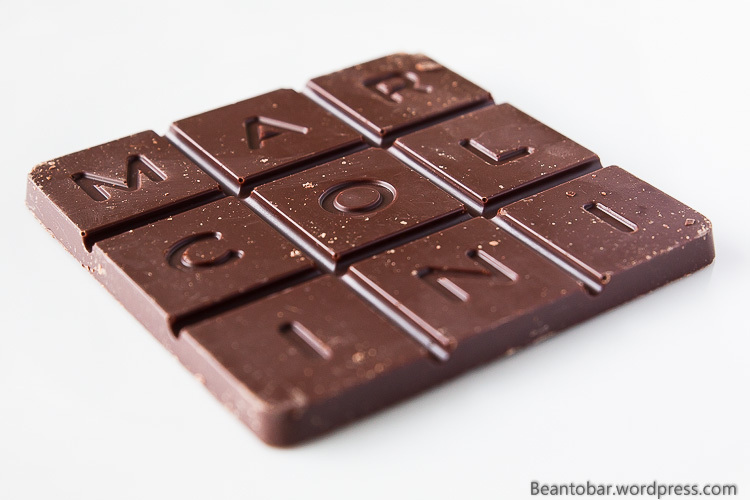 The cacao in this bar originates in the Sambirano Valley in Madagascar. More specific, Domaine d’Ambanja. 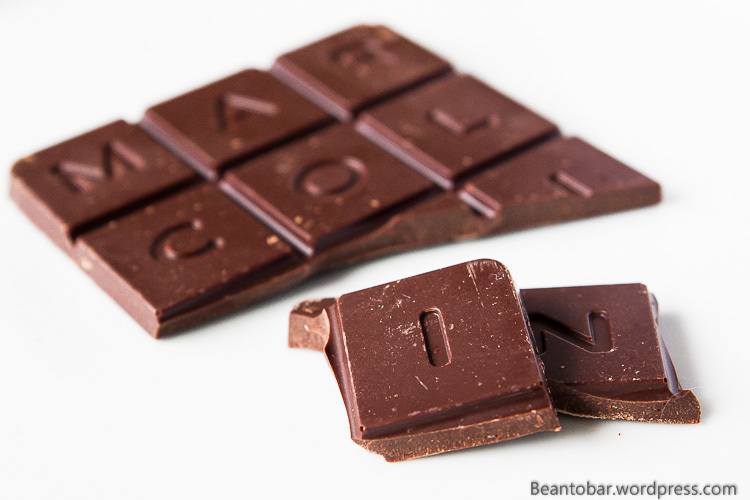 The Trinitario beans used should offer a great aromatic chocolate. Color: A lighter shade of brown with a distinct African red mingled in. Aroma: A clear strong scent of roasted nuts, spices, vanilla and a little fruit acidity. Breaking of a piece reveals lots of roasted cacao earthyness. Taste: The start is a touch sweet, followed by a surprising high bitterness which subdues a bit the Madagascan fruit flavors. It is not a coffee type bitterness, rather a more tannin like taste, somewhat reminding of wood. The texture is not super smooth, even slightly grainy and dry, though the melt is long. The bitterness keeps up through the entire melt. There is some vanilla and other warm spices present in the back, but non of the tastes comes out particular strong. The typical red fruit profile of Madagascar is present, yet doesn’t seem to blossom to the full power compared to other Madagascan bars. It is a rather discrete bar in my opinion. 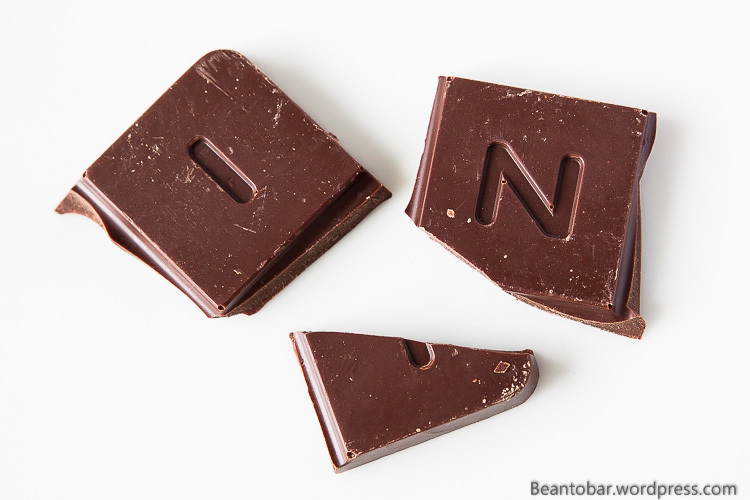 The aftertaste reveals more cacao and chocolate and prolonged tannin. Somehow this bar confuses me a bit. It doesn’t offer the complexity as found in other bars. But it does show the typical tastes of Madagascar and it is a Belgian chocolate bar that actually has taste! The tanninlike bitterness pushes me out of balance though. I’m not very fond of the effect it has on the other flavors. Somehow it reminds me of a dark roasted cacao. I wonder how the taste would be affected when the bitterness was reduced. Pierre Marcolini is my staple food here. I’m so lucky having such an awesome place nearby.